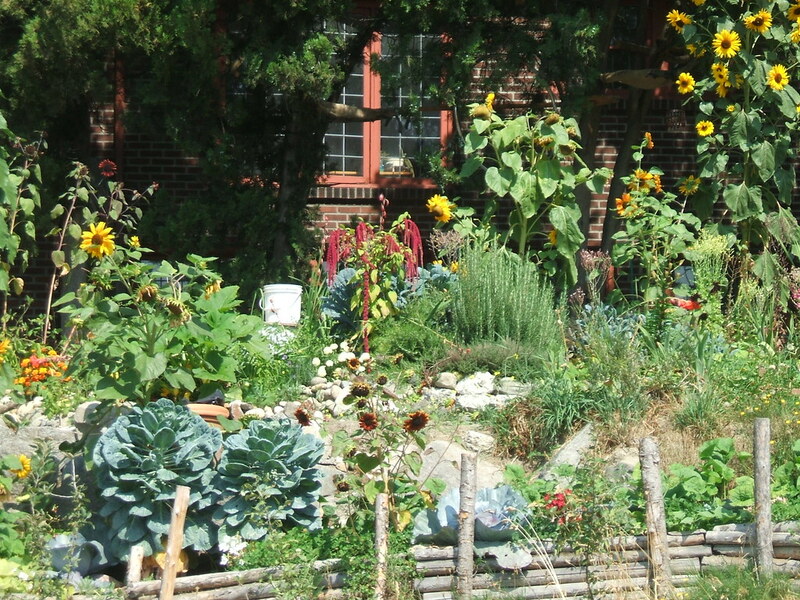 Often, the urge to garden in the city despite lack of an ideal site is just overwhelming. Waits for P-patch slots can be years-long, so sometimes people just get out their shovels and dig wherever they can, whatever the challenges may be. A few years ago, I saw a guy working on a steep, brush-covered hillside at the corner of a very busy freeway on-ramp here in Seattle. I couldn’t actually believe he was making a garden there, but he was. He cleared the brush and weeds away, tilled the soil, and started planting. 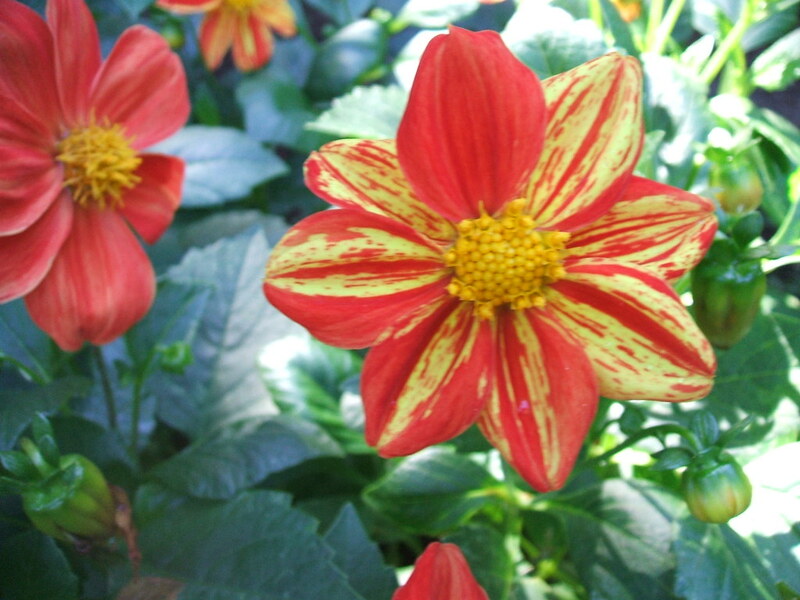 And not just tough, easy-care plants, but veggies and flowers. Lots of them. I used to pass this garden several times a day but hadn’t for a while, and I was delighted to see that it is still thriving despite the daily dose of exhaust it must get from all the passing cars. And despite being at a kind of hard-scrabble crossroads where a lot of down-and-out folks hang out, nobody seems to have raided or vandalized the plot. I don’t know how many people notice or enjoy it as they hurry past, but for me it’s a true testament to the creativity and tenacity of the urban gardener. 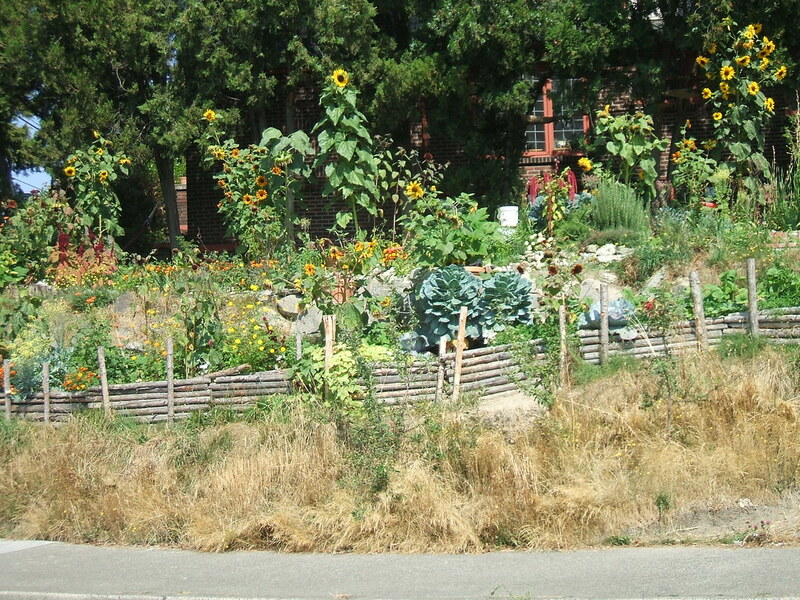 This is the view you see from the street – sunflowers, amaranth, marigolds, kale, cabbages, rosemary – the works! Red, orange and yellow to brighten a dull stretch of road – what’s not to love? 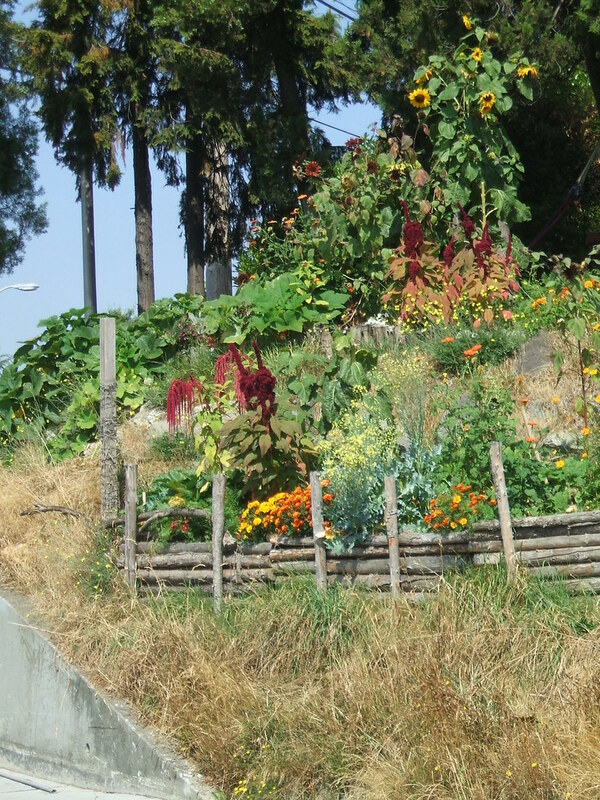 In this one, you can see the simple wooden retaining wall the gardener built to hold in soil and maybe keep folks from wandering in from the sidewalk. The onramp retaining wall is visible in this next shot – no joke, it’s right there! 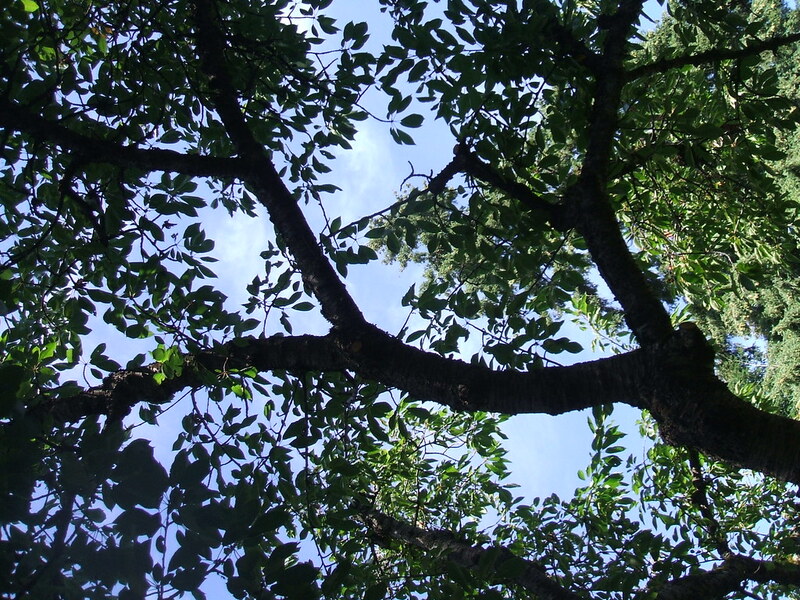 Have you ever gone to great lengths to establish a garden in a non-ideal site? Soon those leave will be a thing of the past. And the future, maybe, if they head to the compost pile. Wish we could bank the sun in the same fashion! 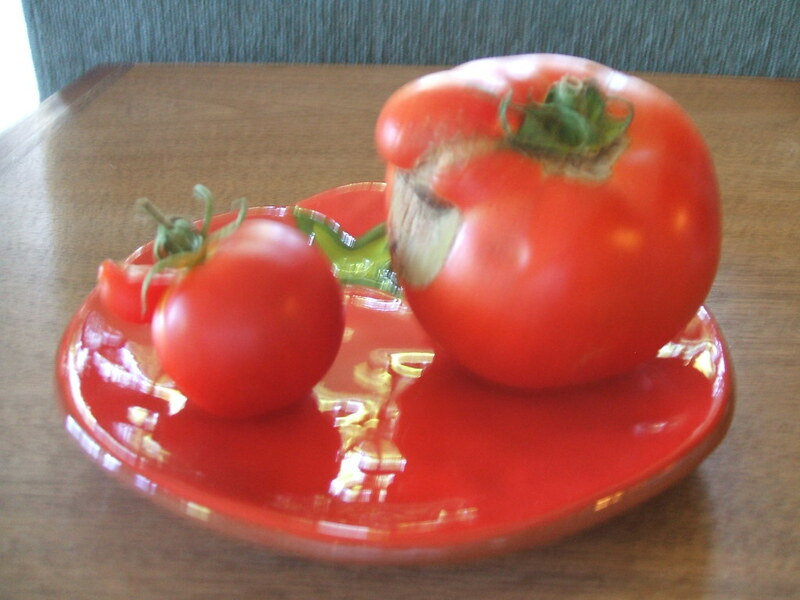 My folks grew these ultra-goofy-looking tomatoes – I picked them up a few days too late for Molly’s tomatoes-with-body-parts contest, so they didn’t win any prizes, but they sure might have. Photo is blurry but maybe you can still see, they’re pretty hilarious. What’s the oddest-looking edible you’ve ever grown?